The versatility of haddock makes it an ideal companion for a variety of salads. 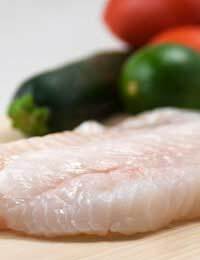 Haddock is a white sea fish that has much in common with cod. Its flesh is flakey and can be purchased whole or as fillets and steaks. One of the most popular haddock salad dishes is a warm salad that also uses bacon and egg. It is relatively straightforward to make and should take approximately 30 minutes. First take the fillets of haddock and brush with olive oil before placing under a medium heat grill for approximately 5 minutes. After this period of time it should be possible to use a tip of a knife to flake the fillets of haddock. Once grilling has been completed remove the fillets of haddock from the grilling pan and place on one side to cool. Next take the rashers of bacon and grill these for approximately 5 minutes. After this period of time the fat should have crisped. After removing the bacon rashers from the grilling pan pour the juices from the grilling pan into a bowl. Then take the sherry vinegar, mustard, pepper and remaining olive oil and whisk them all together in the bowl. Next take the new potatoes and, after having sliced them, place them in a bowl and add the flaked haddock. Next add the baby spinach leaves and toss together before pouring on the dressing. The eggs should then be poached for approximately 4 minutes. During this time, place the haddock salad on the two plates, ensuring that you top with the rashers of bacon, before topping with the poached eggs. To give a haddock salad a French flavour it is possible to make use of croutons, French bread and French beans. The dressing should be made before a start is made on the salad. This is quick and easy. Take the mustard, 3 tablespoons of olive oil, a pinch of salt, vinegar and 1 tablespoon of water and whisk together. To make the salad, take the torn bread and place on a baking tray before pouring over approximately 3 tablespoons of olive oil. It is very important to ensure that the bread is well coated. Place the baking tray on the bottom of the grill and toast for approximately 10 minutes. During this time the bread should be regularly tossed. While the bread is toasting take the French beans and boil for approximately 5 minutes. Once cooked the beans should be removed from the boiling water, ensuring that the water remains in the pan, before placing them in a bowl with a small amount of dressing. Next reduce the heat of the water and poach the fillets of haddock for approximately 5 minutes. Once the haddock is poached place the fillets on a plate and splash on a little vinegar. Next poach the eggs for approximately 3 minutes and then drain off all excess water. Then take the salad leaves and place in a bowl before adding large chunks of flaked haddock. Next add the croutons along with the beans and the majority of the dressing before tossing everything together. Place on 2 plates and top with eggs before pouring over the remaining dressing.